Telstra Corporation Limited is Australia’s leading telecommunications and information services company competing in all telecommunications markets in Australia. In 2012 Telstra unveiled a new colourful identity that aimed to capture the diversity of its products, services and customers, the changes to Telstra’s visual identity were designed to create a stronger and more emotional connection with Telstra’s customers. In October 2012 Adhere Promotions won the tender to supply Telstra with a catalogue range of products. Adhere designed, developed and manufactured a diverse range of pre-branded functional products, Pantone color matched in Telstra’s brand colours. All products reflected Telstra’s new colourful identity, adhere to Telstra’s strict brand guidelines whilst portraying a perfect balance between price and quality. This has allowed Telstra as a business to ensure consistency of brand application across the range of catalogue items. The product scope was developed to meet a high quality criterion, whilst accommodating a range of price points across the items ensuring efficiencies for Telstra’s retail and corporate business areas around the country. We also provide the option of further customisation on the basic range fulfilling over decoration as required. 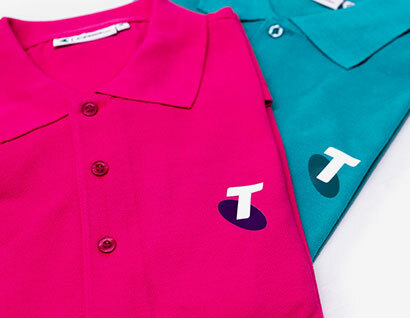 Our in-house graphic design team has been an key element to the success of this merchandise program and for all additional products designed and produced for Telstra, with quick turnaround of concepts in line with Telstra’s brand guidelines. To facilitate ease of ordering the products, we designed and built a web portal that is stand alone for external orders and pulls through to Telstra’s internal finance module for internal Telstra orders. We also added a facility for individuals, Telstra licensed shops, and other non-company sources to access and purchase the Telstra branded merchandise. Adhere warehouses and distributes the extensive Telstra catalogue range Australia wide, providing a full marketing solution.